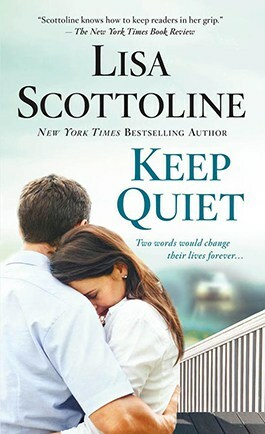 Scottoline delivers once again with Keep Quiet, an emotionally gripping and morally complex story about one father’s decision to protect his son — and the devestating consequences that follow. Jake Buckman’s relationship with his sixteen-year-old son Ryan is not an easy one, so at the urging of his loving wife, Pam, Jake goes alone to pick up Ryan at their suburban movie theater. On the way home, Ryan asks to drive on a deserted road, and Jake sees it as a chance to make a connection. However, what starts as a father-son bonding opportunity instantly turns into a nightmare. Tragedy strikes, and with Ryan’s entire future hanging in the balance, Jake is forced to make a split-second decision that plunges them both into a world of guilt and lies. Without ever meaning to, Jake and Ryan find themselves living under the crushing weight of their secret, which treatens to tear their family to shreds and ruin them all. Powerful and dramatic, Keep Quiet will have readers and book clubs debating what it means to be a parent and how far you can, and should, go to protect those you love. Jake Buckman knew his son had a secret, because his wife told him so. They didn’t know what it was but they suspected it was about a girl, since Ryan had been texting non-stop and dressing better for school, which meant he actually cared if his jeans were clean. Jake wished he and his son were closer, but it was probably too late to turn it around. Ryan was sixteen-years-old, and Jake couldn’t compete with girls, friends, the basketball team, Facebook, Call of Duty, X-Box, Jay-Z, Instagram, and pepperoni pizza. No father could, least of all an accountant. Jake drummed his fingers on the steering wheel, waiting in front of the multiplex for Ryan, who’d gone to the movies with his teammates. The rift between father and son began five years ago, when Jake lost his job. The accounting firm he’d worked for had gone bankrupt in the recession, and he’d been out of a job for almost a year. They’d lived on his unemployment, his wife’s salary, and savings, but he felt ashamed at the brave smile on Pam’s face, the snowglobe of bills on the kitchen table, and the endless rejection by jobs for which he was overqualified. He shuddered, thinking back. Since he hadn’t been able to get a job, he’d done something he’d always wanted to do, start his own financial planning business. He named it Gardenia Trust for Pam’s favorite perfume and he’d dedicated himself to getting it off the ground. He’d worked days and nights at a rented cubicle, cold-calling everyone he knew to drum up clients. He’d said yes to every speaking engagement, keynote or not. He’d given seminars at retirement villages, Rotary Clubs, and libraries. In time he became one of the top-ten ranked financial planners in southeastern Pennsylvania, but it had taken a toll on his family. He and Pam had fixed their marriage with counseling, but in the meantime, Ryan had grown up. Only Pam believed Jake could still fix his relationship to Ryan before their son left for college. She’d encouraged him, even tonight. Go pick him up at the movie, she’d said. He’s expecting me, but you go instead. The movie theater was wedged between Best Buy and Nordstrom’s, and cars idled out front, their exhausts making chalky plumes. Jake wondered if some of the other parents were in the cars, but he wouldn’t recognize them anyway. He’d only attended one or two Parents’ Nights, a National Honor Society induction, and assorted basketball finals, because Ryan played varsity. Pam went to all of Ryan’s games, having more flexibility in her work schedule, and Jake had told himself that her being there was the same as his being there, as if he could parent by proxy. He’d been wrong. He’d made himself superfluous in his own son’s life. His wife was the keynote. A crowd flowed from the multiplex, lighting cigarettes, checking phones, and chatting as they passed in front of his headlights. Jake looked over to see Ryan push open the exit door with his shoulder and roll out of the theater with his teammates, whose names Jake had made a point to memorize; Caleb, Benjamin, and Raj. They were all tall, but Ryan was the biggest at six foot five and 225 pounds, the scruffy tentpole of a shuffling group of shaggy haircuts, black North Face jackets, and saggy pants — except for the two girls. Jake shifted upwards in the driver’s seat, surprised. He hadn’t known Ryan and his buddies were going to the movies with any girls and he was pretty sure Pam didn’t, either. One girl was a redhead and the other a long-haired blonde, who stood near Ryan. Jake wondered if the blonde was the mystery girl and if he could get a conversation going about it with Ryan, on the way home. Pam always said her best conversations with him happened spontaneously, while they were driving around. If so, Jake would plan his spontaneity. The girls waved goodbye, and he waited for Ryan to notice the Audi. He’d texted to say he was coming, but Ryan hadn’t replied, so he couldn’t be sure the text got delivered. Jake didn’t honk, wave, or do something else dorky, so as not to embarrass himself or suburban fathers in general. Jake saw Ryan slide his iPhone from his pocket and flick his bangs back, so that the phone illuminated his son’s face. Ryan had large, warm brown eyes, a long, thin nose and largish mouth, his handsome features framed by wavy and chestnut-brown hair, which he kept longish. Everybody said Ryan was the spitting image of his father, but Jake knew that was true too many years and twenty-five pounds ago. Jake was forty-six years old, with the crow’s feet, graying temples, and a starter paunch to prove it. He always said that Ryan got his size from his father, but his brains from his mother, which was the best of both. Jake watched as Ryan looked up from his iPhone, spotted the Audi, and jerked his chin up in acknowledgment, then slapped Caleb’s palm and came toward the car. Jake unlocked the passenger door, and Ryan opened it and slid inside, his jacket slipping against the leather seat. “Where’s Mom?” he asked, eyebrows lifting. “Okay. You left Moose home?” Ryan kept an eye on his iPhone screen. “Oops, yeah.” Jake hadn’t thought to take the dog, though Pam carted him everywhere. He disengaged the brake, fed the car gas, and headed for the exit. “I get you didn’t want him to come. This car is too awesome.” Ryan kept his head down, his thumbs flying as he texted, growing the blue electronic bubble on the phone screen. “It’s okay, do your thing.” Jake steered around the back of the King of Prussia mall, where the lights of JCPenney, Macy’s, and Neiman Marcus brightened a cloudy night sky. Cars were rushing everywhere; it was Friday night, the busy beginning to the weekend. It should have been colder for February, but it wasn’t. A light fog thickened the air, and Jake remembered something he had learned tonight from the pretty weathergirl on TV. Fog is a cloud on the ground. He turned the defrost to maximum and accelerated toward Route 202, heading for open road. Ryan texted away, his hip-hop ringtone going off at regular intervals, punctuated by the Apple-generated swoosh. Jake wondered if his son was talking to the mystery girl. He himself remembered racking up huge phone bills when he first dated Pam, at college. He’d fallen for her their freshman year at Pitt and felt unbelievably lucky when she married him. She was a great wife, and he gave her total credit for Ryan being so well-adjusted and popular, despite his naturally reserved manner. He was earning A’s in AP courses, got solid SAT scores, and was already being recruited by college basketball programs, some Division I. “Oh, right.” Jake forgot, he had asked that already. “How’s Caleb? And Raj and Benjamin?” He wanted to show he remembered the names. Ryan didn’t look up from his phone, his thumbs in overdrive. Pink and green bubbles popped onto his phone screen, so he was texting with more than one person, like a conference call for teenagers. “Yeah.” Ryan still didn’t look up. “Nice.” Jake let it go, an epic fail, in the vernacular. He pressed a button to lower the window, breathing in the moist, cool air. The fog was thickening, softening the blackness of the night, and the traffic dropped off as they approached the Concordia Corporate Center. They passed glowing signs for SMS and Microsoft, then turned onto Concordia Boulevard, which was lined with longer-stay hotels. He’d eaten enough of their reception-desk chocolate-chip cookies to last a lifetime, because even his out-of-town clients were in the suburbs, the new home of American business. Jake returned to his thoughts. His own office was in a nearby corporate center, and he spent his days ping-ponging between his corporate center and his clients’ corporate centers, after which he drove home to his housing development. Some days the only trees he saw were builder’s-grade evergreens, planted in zigzag patterns. Lately he felt as if his life were developed, rather than lived. He was a financial planner, but he was coming to believe that too much planning wasn’t natural for trees or accountants. “Me, too.” Jake grinned, feeling the spark of a reconnection. They both liked cars, and last year, when Jake’s old Tahoe hit 132,000 miles, he’d bought the Audi, mainly because Ryan had lobbied for one. Jake was a born Chevy guy, but Ryan had built umpteen online versions of the flashy Audi on the company website and designed what he called a “dream machine”; an A6 sedan with a 3.0 liter engine, Brilliant Black exterior, Black leather interior, and Brushed Aluminum inlay on the dashboard. They’d gone together to pick it up, and Jake had given Ryan a few driving lessons in it, when Ryan had the time. “I’m blowing up.” Ryan smiled. Yes! Jake realized he’d said the exact right thing, and Ryan shifted around to face him, with a new grin. “Relax, remain calm.” Jake braked as he approached the street. “We’ll see.” Jake cruised to a stop, letting an oncoming truck pass, then made a left and pulled over, so he could scope out the scene. Pike Road was a long street that ran between the woods on its right and the Concordia Corporate Center, on its left. It was used mainly as a shortcut to the corporate center parking lots, and during the week, corporate running teams and athletic teams from Jake’s high school used it to train. There was no traffic on the weekends. “Dad, please.” Ryan leaned over, his eyes pleading, and Jake didn’t want to ruin the mood. “Gotcha!” Ryan plopped into the driver’s seat, and Jake walked to the passenger seat, got in, and closed the door behind him. He didn’t have to adjust the seat because they were the same size. “On it.” Ryan pushed the button to rotate the outside mirror, then reached for the rearview, and Jake watched him line it up, with approval. His son was careful and methodical, a perfectionist like him. Ryan even enjoyed practicing, especially basketball. Once he had told Jake that it took two-and-a-half hours to shoot a thousand foul shots, and Jake didn’t have to ask Ryan how he knew. “I wasn’t going to.” Ryan fastened himself into the seat with a click. “Agree.” Ryan peered at the dashboard and switched them on. “Take a second and look around.” Jake looked down the street with Ryan, the high beams cutting the light fog. Pike Road was a straight shot the length of the corporate center, then took a sharp curve to the right. Tall trees lined the road, their branches jagged and bare. “Good to go.” Ryan released the emergency brake as his phone signaled an incoming text. “Don’t even think about getting that text. No texting while driving.” Jake himself had stopped texting while he drove unless he was at a stoplight, and he talked on the phone only if he had the Bluetooth. “I saw her.” Jake relaxed in the seat, since Ryan had everything in control. “Sure. Short is good. I like short. Your mom is short.” Jake smiled. Pam was only five foot three, and his mother had called them Mutt and Jeff, back in the days when people knew who Mutt and Jeff were. Jake’s mother had died ten years ago of blood cancer, and he still missed her every day. He didn’t miss his father at all, though his father had outlived his mother by six years, which proved that not only was life unfair, but death was, too. “Her name’s kinda weird, not gonna lie. Janine Mae Lamb. Janine Mae is her first name. You have to say both names.” Ryan maintained his speed as they approached the curve, marked by a caution sign with an arrow pointing right. “On it.” Ryan slowed down. “Agree!” Ryan beamed as they reached the curve, and Jake felt happy for him. “A restaurant? Dude, we’re not olds like you!” Ryan looked over in disbelief as he steered around the curve, and Jake met his eye, bursting into laughter. But in that split-second, there was a sickening thump. They jolted as if they’d hit something, and Ryan slammed on the brakes, cranking the wheel to the left. The right side of the car bumped up and down, fishtailed wildly, and skidded to a stop. And then everything went quiet. At heart, Keep Quiet is about a parent who makes a mistake. Have you ever made a mistake, as a parent? If you did, do you understand why it happened? Jake Buckman made the mistake because he wanted to protect his child, and because he wants to make up for not having spent enough time with him in the past. He says yes to his son when he should have said no. Jake knows he has made a mistake as soon as he makes it, but he cannot unmake it. Can you imagine being in that kind of a bind? Have you ever been? Jake made his split-second decision in an emergency, with the intention of saving his son. How do you react in emergencies? Are you cool and calm under pressure, or do you get flustered? Who do you lean on in emergencies? What do you think you would have done in Jake’s position? Jake and Ryan’s relationship suffered because Jake was working so many hours to build his business. What do you think motivated Jake to work so hard? Was he creating a fiscally sound base for his family, or was he feeding his own need to be successful? Either way, is there anything wrong with what he did? How do you think Jake’s own childhood contributed to his view of what it meant to be a good dad? Although Pam is closer to Ryan, she is not a perfect parent either. What mistakes do you think she made, and do you understand why she made them? Did you like her? Why or why not? How would you describe her, and do you view her as a helicopter mom? Is that a bad thing? Do you think the closeness that Pam and Ryan shared sometimes squeezed Jake out of the picture? What responsibility, if any, do Pam and Ryan have for Ryan’s relationship with Jake? Do you think any of the decisions that Pam and Jake made would have been different if Jake were not an only child? How does having other children in the home influence your parenting practices? What kind of pressure comes with being an only child? Do you have siblings? If so, in what ways do you think your life would have been different if you were an only child, or if you came from a family full of children? Ryan spends much of his free time playing or practicing basketball, and you can feel the pressure on him, whether perceived or real, to perform. Youth sports today is no longer just recreational. Between travel teams, tournament teams and private training, do you think parents today have lost perspective on the importance and/or the benefits of being part of a youth sports team? Do you think it is harmful or beneficial for the kids? Are parents too heavily invested emotionally in the success of their children when it comes to sports or any other youth activities? Do you think kids are learning the right life lessons that should come from youth sports? What punishment do you think Ryan deserved? Did he deserve to go to jail? How do you think the justice system would have handled Ryan’s case? Does the punishment always fit the crime? Teenagers make stupid mistakes. In a way, we are expecting them to. Who was more responsible for what happened, Jake or Ryan? Should Jake have faced jail time? Although they say it takes a village to raise a child, what rights do other adults have to parent your child? Do you think Dr. Dave overstepped his bounds in trying to help Ryan? Have you ever had a parent reprimand your child inappropriately? Did you say anything? How do you speak to your child without undermining the authority of adults?